The Lubavitch: The Real Estate Laws Don’t Apply to Them…There will be a legal battle! 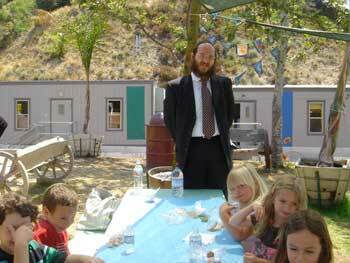 Rabbi Zushe Cunin, who heads Chabad of Pacific Palisades, with son Zalmen Cunin, 4. 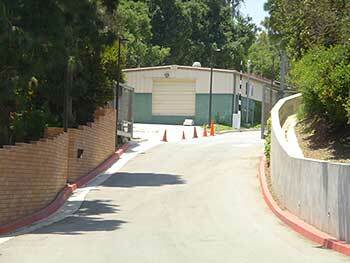 Pacific Palisades neighbors and others object to plan for a site next to Getty Villa. What got them talking wasn’t the news that 10 tons of fresh snow would be trucked in for the April 6 event at the public Temescal Gateway Park, where the preschool operates out of three trailers and a fenced playground. No, it was the mention that the Chabad preschool would maintain its “natural setting” come fall when it moved to a location in the Castellammare area of the Palisades. A new playground for the Palisades Jewish… Early Childhood Center has been built in Pacific Palisades near the Getty Villa property. Residents of the area are concerned about how parents will access the school as it would possibly share a driveway with the real entrance of the Getty VIlla. “The new facility will be open for community visits on or about May 5. Enrollment is now underway,” the item read. “What preschool?” residents of the quietly exclusive coastal enclave wondered. Thus began a saga with more twists and turns than “Mr. Toad’s Wild Ride,” as one resident wryly calls it. How else to refer to a controversy, now coming to a head, that involves a branch of Judaism often characterized by ecstatic piety, the Mormon church, the Getty Villa, the state Department of Parks and Recreation, the California Coastal Commission, a city councilman, and a bunch of his affluent and highly agitated constituents for whom money is no object? Chabad next looked to Bellino Drive on the hilltop above Gladden’s warehouse. That entry point was problematic because it meant using a driveway shared by other residents, including actor Bo Svenson, who were vehemently opposed to the idea. From Bellino, the drive briefly descends before taking a sharp left turn. There is no convenient turnaround space. From Gladden’s house, children, parents and staff would have to walk down a steep trail. The fact that Chabad would even consider it irritated some Bellino residents. “To me, as a Jew, this is chutzpah, and I’m offended that a community within my own religion would be behaving toward a residential neighborhood in this manner,” said Mike Lofchie, a member of the Castellammare Mesa Home Owners Assn. Many mainstream Jews regard the movement’s outreach as evangelizing, a practice they frown upon. In California, Chabad is perhaps best identified with its annual star-studded telethon, which raises money for charities. Chabad is also known for zoning conflicts with neighbors as rabbis seek to establish gathering spots — known as Chabad houses — in residential areas. Over the years, zoning battles have raged in Florida, New York and New Jersey. With the Getty road and Bellino effectively out of the picture, Cunin, 38, said Chabad is seeking permission from Mormon Church officials in Salt Lake City to use the Los Liones church parking lot. “We’re very hopeful, and we believe that our access will be through the church parking lot,” he said. “We want to be good neighbors and certainly help other faith groups where we can, but we need to be sensitive to all of the neighbors,” Atkinson said. Los Angeles City Councilman Bill Rosendahl met Friday with Cunin and got his assurance that Chabad would follow the city’s conditional-use permit process. The school isn’t the only issue causing friction. A couple of miles east of Los Liones Canyon, Cunin is embroiled in a controversy with neighbors over plans to dramatically enlarge his house. The Pacific Palisades Civic League, which reviews architectural plans for new construction and remodels, has been talking with Cunin, who has already secured city permits. The league’s opinions are not binding, but its board is pressuring the rabbi to abide by neighborhood guidelines. A huge immigration raid last week on the country’s largest kosher slaughterhouse could have a substantial impact on the thousands of Jews who follow Jewish dietary laws, as well as on non-Jews who purchase kosher meat. The Agriprocessors Inc. plant in Postville, Iowa, is one of the largest of a small number of U.S. meat producers that satisfy Jewish dietary restrictions, called kashrut. Federal authorities arrested 400 people in the raid, and the Justice Department said this week that 85 had pleaded guilty to felony charges involving the use of false identifications to obtain employment. They also admitted to being in the country illegally and now face deportation, the department said. As a result, the plant, which was shut down the day of the arrests, will face a challenge replenishing its 800-person workforce. “I don’t think the Jewish community can survive at this point without Rubashkin,” Mordechai Yitzhaky, owner of KosherMart in Rockville, said of the family that owns Agriprocessors. Industry-watchers and butchers say they have heard reports of hoarding since the raid, but the impact will not be known for several days, as individuals and stores still have frozen supplies. Muslims also sometimes buy kosher meat, as Islamic dietary restrictions are similar to kashrut, and it can be hard to find halal — or acceptable by Islamic law — food in most U.S. communities. For the estimated 1 million Americans who observe kosher restrictions, Agriprocessors’ latest troubles ramp up a discussion that has been underway for several years: Can a company meet religious standards if it violates ethical ones? Agriprocessors has been cited multiple times by federal and state regulators for food-safety, environmental, labor and animal cruelty violations. The violations were widely reported by a Jewish newspaper, the Forward, prompting Jewish advocacy groups to note that Jewish law protects workers and forbids inflicting unnecessary pain on animals. So far, no officials from Agriprocessors have been charged in the immigration case. The company has been fined hundreds of thousands of dollars for labor and environmental charges in previous years, and it faced two recent meat recalls. But Agriprocessors’ record has provoked calls for an extra certification — or stamp — for kosher food companies based on practices that go beyond kashrut rules, which dictate matters such as how an animal’s throat is cut or how thoroughly blood is removed after an animal is killed. The aim would be to supplement these rules with requirements satisfying the broader spirit of Jewish law. The additional certification requirement, already endorsed by the national body of Conservative rabbis, would also include how a company treats its workers and the animals it slaughters. Last week’s affidavit filed by the U.S. Immigration and Customs Enforcement quoted unnamed informants alleging that Agriprocessors paid undocumented workers $5 an hour and underreported worker injuries. The informants also asserted that there was a methamphetamine lab in the plant and that weapons were either “traded for drugs or sold” on the premises. Agriprocessors declined to comment on the allegations but said it is cooperating with the government. Some rabbis say that even past and current allegations of mistreatment should not be confused with a scriptural mandate. These rabbis argue that although such allegations may violate other aspects of Jewish law or ethics, they do not disqualify the meat as technically kosher. Rabbi Menachem Genack is head of the kashrut division at Orthodox Union, which certifies as kosher the most products in the world. He said he has worked with Agriprocessors on its issues, even bringing the meat company together with animal rights activists. But Genack said issues such as food and worker safety do not violate kashrut. “The Bible talks about issues like workers’ welfare, and they are important to us, but the authority and expertise on such issues should be with government agencies,” he said. “We rely on them, and I’ve said many times we will follow their lead.” Genack said it would sever its relationship with a firm if it had “some serious violation of the law,” such as a felony conviction. The system of kashrut, or how to “keep kosher,” was laid down in the Torah and in later, centuries-old rabbinical writings. The system exists for health reasons, to encourage humane treatment of animals, and as a constant ritual that reminds Jews of their identity. Kashrut governs what not to eat (shellfish, pork, insects, milk and meat together), how to eat (wait a certain period between meat and milk) and even how to organize one’s kitchen (separate plates and sinks for milk and meat). Kashrut requires special certifiers to inspect food factories and ingredient lists to be sure no items that are not kosher get into the mix. Joe Regenstein, a Cornell University food scientist who works with the kosher and halal food industries, said Orthodox Jews are becoming “a little impatient” with ethical issues and are beginning to reject some food even if it has a kashrut stamp. However, he said, the industry is tiny, so Orthodox Jews do not have a lot of options. Raid Could Make Postville A Ghost Town! Some sluthing around found an interesting web blog, “The Problem With the Lubavitch”. It seems that the Chabad Lubavitch, a worldwide Jewish organization headquartered in Brooklyn, N.Y. owns the Postville processing plant. The Lubavitch are very quietly anti-Israel and the established Jewish-American community does not recognize them. Without going into a lot of detail, which you can read yourself, they appear to operate with questionable business practices and outright scams to increase their profits. The town of Postville has had a history of conflict around Agriprocessors, Inc, and it’s Postville facility has a history of noncompliance with state and federal regulations related to food safety, pollution and workplace safety. CEDAR RAPIDS, Iowa — Federal immigration agents in northeastern Iowa raided the world’s largest kosher meatpacking plant yesterday, arresting more than 300 people and housing many of them at a converted fairgrounds.The raid of the Agriprocessors Inc. plant in Postville was the largest in state history and had been planned for months, U.S. Attorney Matt M. Dummermuth said. The raid, one of several conducted at meat-processing plants around the country in recent years, was aimed at seeking evidence of identity theft, stolen Social Security numbers, and people who are in the country illegally, an ICE spokesman, Tim Counts, said. Authorities arrived at the Agriprocessors plant about 10 a.m. and presented company officials with search warrants. Agents asked to speak with all the employees, and plant officials cooperated and shut down their operations. Agriprocessors did not immediately return messages seeking comment. Of those arrested, 44 were released for humanitarian reasons, primarily because they must care for children. They were ordered to report to court later. Others arrested were held in local jails or driven by bus about 75 miles to temporary housing at the National Cattle Congress fairgrounds in Waterloo. Federal authorities previously leased the fairgrounds and have turned it into a secure center. Sister Mary McCauley, a Roman Catholic nun at St. Bridget’s Catholic Church in Postville, said family members of plant workers came to the nearby church in tears after immigration agents arrived in buses, vans, and two helicopters. Sister McCauley said she went to the plant to help provide information and assist workers but was not allowed to get close. “Some of the people that are going to be detained are up against a fence and now they’re tying their hands,” she said. Many of the plant workers are Hispanic, mostly from Mexico and Guatemala, she said. Mr. Counts, the ICE spokesman, said a toll-free telephone number had been set up to assist family members of those arrested who have questions about their detention status and the removal process. Asked about the raid during a news conference yesterday, Governor Chet Culver said both illegal immigrants and companies that knowingly hire them should be prosecuted. A Jewish patrol group says it protects Crown Heights. Others call its members vigilantes. 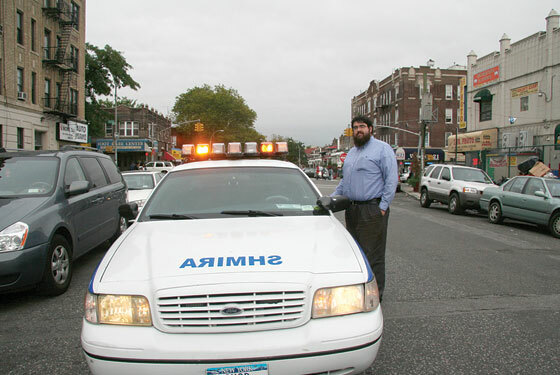 A Shmira volunteer with the group’s patrol car. On the evening of April 14, a 20-year-old black man named Andrew Charles was attacked with pepper spray and then beaten by a pair of Hasidic assailants in his Crown Heights neighborhood. The attackers escaped in a GMC Envoy, and although Charles didn’t catch the plate number, a witness did. Police traced its registration to another neighborhood resident, Menachem Ezagui, who police say is a member of a local volunteer security-patrol group called the Crown Heights Shmira. He was picked up by police, but when the victim couldn’t identify him in a lineup, he was released. The investigation remains open, and the Shmira isn’t helping. Yet this cult has brazenly published, disseminated, taught and promoted the hatred of a great many “identifiable groups” (Christians, Muslims,and all other non-Jews) by casting them as subhuman and demonic. In the quotations below, taken from their own literature and in their own officially sanctioned English translation, the members of “Chabad-Lubavitch” openly declare that Christians and Muslims are all “evil.” Why? Because they are supposedly created and sustained by theSatanic forces of the universe (called “kelipot” or shells in their jargon). 5. and that it is their sacred duty to hasten the arrival of this”Messiah” in order to accomplish the forcible conversion or subjugationof non-Jews as soon as possible. These are just some of the racist teachings of the fanatical messianiccult named “Chabad-Lubavitch.” This cult, masquerading as “authentic Judaism,” has been promised nearly one million dollars in funding by the government of Premier Lucien Bouchard of Quebec in order to build itsnew religious and “outreach” (missionary) complex in Cote St. Luc, Montreal. Why should you care? Because Chabad-Lubavitch is not just our problem, it may be yours as well. It is an extremely powerful, world wide organization. Its power has until now intimidated the media, who are afraid to expose the evidence of racism produced here to the public, lest they be accused of anti-semitism. We desperately need your help in breaking this media blackout. Chabad-Lubavitch preys on young people in search of religious identity and meaning. It is aggressively missionizing and spreading ist religious bigotry around the globe, especially on university campuses. Chances are, there is a Chabad-Lubavitch presence in your city already. Here are three typically racist passages taken from the basic textbook of Chabad-Lubavitch called “Likute Amarim” or “Tanya.” It is one of the primary texts used in their indoctrination or “outreach” programs. Please note that I am using their own, officially sanctioned English translation (published by their “Kehot Publication Society” New York –London, 1973). “The souls of the nations of the world (i.e. all Christians, Muslims,Buddhists, etc. ), however, emanate from the other, unclean ‘kelipot’ (evil forces) which contain no good whatever” (page 5). “However, the ‘kelipot’ (evil forces) are subdivided into two grades, one lower than the other. The lower grade consists of the three ‘kelipot’ which are altogether unclean and evil, containing no good whatever. From them flow and derive the souls of all the nations of the world (i.e. all Christians, Muslims, etc. ), and the existence of their bodies, and also the souls of all living creatures that are unclean and unfit for consumption” (chapter 6, page 25). “To elucidate still further, it is necessary to clarify the meaning of the verse, ‘The candle of God is the soul of (neshamah) of man.’ What it means is that the souls of Jews, who are called “man”, are, by way of illustration, like the flame of the candle, whose nature it is always toscintillate upwards… Now this is a general principle in the whole realm of holiness… This stands in direct contrast to the so-called ‘kelipah’ (evil forces) and ‘sitra achara’ (the other, evil side), wherefrom are derived the souls of the Gentiles… Therefore they (theGentiles) are called ‘dead’… (chapter 19, page 77 and 79). This text makes it clear that for Chabad-Lubavitch, only Jews are considered human (“called man”). They teach that non-Jews are sub-human creatures who barely even qualify as living beings (they are called”dead”). If you would like to receive photocopies of these quotations which are taken verbatim from the Chabad-Lubavitch textbook (Hebrew original with their own official English translation), please send me your mailing address. The nearly yearlong dispute between the Chabad-Lubavitch Center of Needham and the town appears to be headed from the bargaining table to the courtroom. Last week, attorneys Robert Meltzer and Richard Csaplar filed a complaint in US District Court in Boston stating that the town and Building Inspector Daniel Walsh “intentionally and with malice” tried to deny the chabad center its constitutional rights to free speech and to the free exercise of religion and assembly. The complaint was filed on behalf of Rabbi Mendel Krinsky, who is seeking $10 million in damages. The chabad is located in Krinsky’s house on High Rock Street. Csaplar said the lawsuit was prompted by a Jan. 20 letter from Walsh ordering Krinsky to cease using the house as a worship center until it receives the necessary permits and town board approvals. Walsh stated in the letter that neither he nor another qualified professional has been allowed to inspect the home to see if it meets state building and fire codes. Complying with Walsh’s demand would mean closing down the center, Csaplar said. Csaplar said the town unfairly tried to curtail the center’s activities over the last year by limiting the number of people who could gather there to 20 and where in the building they could worship. The lawsuit compares the center’s religious gatherings to lawful residential assemblies, such as poker games and watching football on Sunday. Fitzpatrick said she was instructed by legal counsel not to discuss the lawsuit. “I sue cities and towns all the time,” said Meltzer, a Framingham- based trial lawyer. “In my 12 years in this business, I’ve never seen the kind of pigheadedness and stubbornness in [refusing] to listen. “As a son of Holocaust survivors, it’s disheartening when anti- Semitism charges are thrown around loosely,” said Leonard H. Kesten, an attorney and partner with Brody, Hardoon, Perkins and Kesten LLP in Boston who will represent the town and Walsh in the lawsuit. “We’re anxious to get this moving quickly,” Kesten said, adding that he expected that the two sides would appear before a judge within two months. Krinsky and his attorneys say they are considering action against neighbors who have complained to town officials about parking and illegal remodeling. “Everyone on this street is very upset,” said Wayne Anastasia, who lives next door to the center. Anastasia denied that neighbors are harassing worshipers. Anastasia said neighbors are primarily concerned that additional traffic and parking on their road is posing safety hazards, that remodeling work to the chabad is being done without the permits other homeowners would be required to obtain, and that Krinsky may be using a private home as a business.
? 2005 New York Times Company. Provided by ProQuest Information and Learning. All Rights Reserved. It was a little after 7 p.m. on the eve of Lag B’Omer, and Rabbi Mendel Krinsky’s barbecue celebrating the Jewish holiday was in full swing. Children bobbed on the inflatable Moon Bouncer trampoline, which was set up inside after a week of heavy downpours. Adults conversed ebulliently over kosher hot dogs and ginger ale. Three men broke through the chatter with a hymn commemorating Rabbi Shimon bar Mochas, the author of the book of Kabbala. These festivities belied a $10 million lawsuit Krinsky filed in February against the town of Needham after more than a year of disputing with neighbors of the Chabad Jewish Center he runs out of his High Rock Street home. The case will go to mediation June 23 at US District Court in Boston, according to Leonard H. Kesten, the attorney representing the town. The mediation will not be open to the public, he said. In the lawsuit, Krinsky accused the town and Building Inspector Daniel Walsh of trying to prevent the Chabad center from exercising its constitutional rights of free speech and religious assembly. One of his lawyers has said complying with the town’s requests would mean closing the center. Kesten said he hopes this does not evolve from a zoning and neighbor relations dispute to a church vs. state case. Wayne Anastasia lives next to the center and kept a meticulous tally of the guests who attended the barbecue 26 by his count while his other family members noted the license plate numbers of the cars parked on the berm along the street. There was an Ohio plate they had never seen before. He said he views the media coverage and the pending civil litigation as a way of informing others about the Chabad-Lubavitch movement, which is a branch of Hasidic Judaism. Krinsky, 33, was raised in Boston as a Lubavitcher; his father, Pinchus Krinsky, also served as a Lubavitcher rabbi. Chabad is a Hebrew acronym for wisdom, comprehension, and knowledge. Krinsky was educated at rabbinical schools in Montreal, New Jersey, and in Crown Heights, Brooklyn, where the Lubavitch movement headquarters is on Eastern Parkway. He and his wife, Chanie, 29, have four children. Lubavitcher husband-wife teams like the Krinskys have set up Chabad centers in most of the 50 states and cities worldwide. In Boston, there are more than two dozen centers as posted on the website, Chabad.org. While conservative branches of Christianity often proselytize non- Christians, Lubavitchers only reach out to other Jews. Krinsky hopes to “avoid labels” and unify the Orthodox, Reform, and Conservative movements of Judaism. As part of his outreach effort, Krinsky cold-calls Jewish residents in the neighboring communities and schedules appointments to meet them at work. He also sends calendars and newsletters, likening his approach to advertising a business. This year’s calendar includes a list of adult education classes, counseling and hospital visitation services, and craft workshops. It also contains advertisements from Washworld car wash, Needham Collision, and Needham Garden Center. Krinsky often approaches less observant Jews as he aims to expand the Chabad’s congregation. One such new worshiper is Yehuda Inbar, 46, a web designer who has lived in Needham for 10 years. He joined the Chabad more than a year ago because he wanted to practice his religion “closer to the values of traditional Judaism.” For the past two years, Inbar has visited the Chabad almost every Saturday morning at 10 for temple services and has attended Hebrew classes every couple of weeks. Inbar grew up in a nonreligious household in Haifa, Israel, and came to the United States in 1981 to attend the Boston Architectural Center. Now many of his thoughts are about his religion. Instead of TV, he listens to Hebrew lectures on Israeli websites. Centers such as the Krinskys’ have come under fire from municipal governments because they often are in residential zones, where parking can quickly become an issue. Last year, the city of Newton was embroiled in a dispute with a Chabad on Dedham Street. The case was settled, and the synagogue resumed hosting worship services. Mitchell Fischman, an at-large alderman who is on the committee established as part of the Newton settlement, said tensions appear to have cooled. He hasn’t received complaints from neighbors about parking. Krinsky filed the lawsuit against Needham in February after Walsh, the building inspector, sent a letter on Jan. 20 telling him to stop using his residence as a house of worship until he get town permits and board approvals for fire codes, disability requirements, and parking regulations. Walsh wrote that neither he nor other inspectors had been allowed in Krinsky’s home to see if it meets state building and fire codes. One of Krinsky’s neighbors, Marc Jacobs, said his discomfort with the Chabad stems from not knowing what, if anything, Krinsky will do with his residence. Krinsky said he plans to move the congregation to another location once it “becomes uncomfortable” to hold services in the house, though he wasn’t able to give a precise number. At present, he said, “up to 25” attend the Saturday services. Those who attend the Chabad have complained about being photographed and say they’re being harassed, but neighbors say they were told by the town to document their complaints. “I just go crazy taking photos,” said Anastasia, taking out an inch-thick stack of photographs. “People say, `Leave the guy alone. He’s not hurting anyone.’ But they don’t live next to him,” he said of Krinsky.